Simply visit the above-mentioned website and enter the Cuenta number found in the top right section of your older property tax receipt. 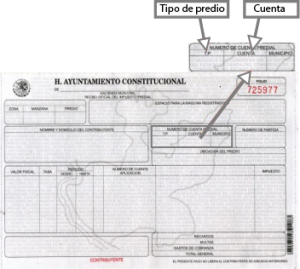 The Tipo de Predio is found to the left of the Cuenta number, both of which must be filled in/selected on the site. Once both selections have been completed, click Buscar. The page that follows will show different payment methods in which one can make the tax payment. If annual property taxes are paid before the end of February, an automatic 15% discount is applied. Starting March 1st, said discount will no longer be available.